Bestow a buff for three turn which prevents Water, Fire and Earth runes from dropping. Nothing but Light and Dark runes and the Dark runes are aligned. Fun with infinite combos! I'll think of some adjustment. Once a douche, always a douche. I'm thinking maybe another Greek SM suited for Greek team mainly. For 3 rounds, recover 5% of team attack per turn. If the team's health is below 40%, recover by 10% of team health instead. 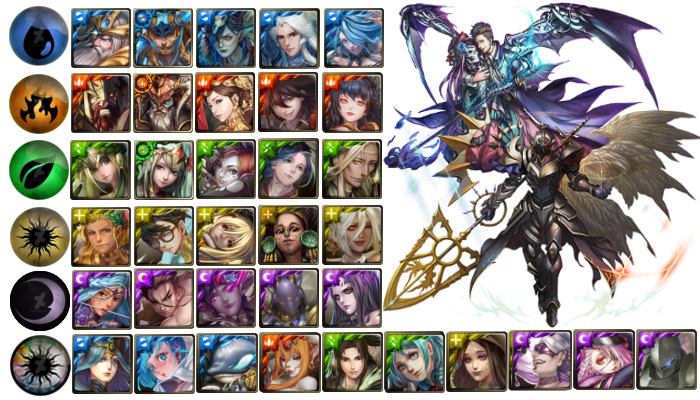 The lower the health, the higher the team attack and the more the monster attacks, to the max team attack x2.5 and the monster attacks for 5 turns. Recovery reduced to zero. For every enemy monster killed, team attack increases, to the max x3.5. Team attack x1.5. After 4 rounds, team attack x4. This runs as a cycle. Attack x2.5, HP x1.25, attribute relation isn't applied. Enemies will become stun for 1 turn, next turn team attack x1.5. Earn 2x Gold in battle. Team attack x2. x2.5 when there are 3 or more God. Attribute relation isn't applied. When team only consists of Water and Fire Attribute, attack x2.5, x3.5 when only consists of Gods. When ally is either one of the Tridevi, change attribute according to Ally. Team attack x3.5 when consists of only Gods. When heart runestones are dissolve, 50% chance of getting attack x1.5. Stats: Co-ordinate to that of Shakti's. Attack x2 for 2 turns. Deals 32 attacks at the enemies (Of original attack). Gold earned from battle x2.5. When paired with Parvati, team recovery x2.5. Meso-American Pantheon: All gods from this pantheon has the same skill according to their attribute. Drop rate of Water runestones will be transfered to that of Earth runestones for 3 turns. Attack x1.25 when >5 combos are made for the first turn. Leader Skill: Resolution of Earth. When ten or more Earth runestones are dissolved, Earth attack x4.5, otherwise, attack x0.75. Attack x1.5 when no Water runestones are dissolved. Self attack x10 but inactivate all leader skills. Activate until defeated or disabled. (Can be multiplied by active skills). Recover HP of 1x recovery. Deal 1x attack every turn after runestones are dissolved. Active: For one turn all combos count -4 for self attack x10. If less than 5 combos are made, self inflict 5x of monster's attack. Leaer: Light attack x2.5, recovery x1.5.